In six and a half pages crammed full of well-based speculations, Vanevar Bush outlines enough plausible artifact and methodology developments to make a very convincing case for augmentation of the individual intellectual worker. Extension of existing photographic techniques to give each individual a continuously available miniature camera for recording anything in view and of interest, and to realize a high-quality 100:1 linear reduction ratio for micro-record files for these photographs and published material; voice-recognition equipment (perhaps requiring a special language) to ease the process of entering new self-generated material into the written record--these are to provide the individual with information-generating aid. With the way we perceive Nature, projecting our own values for morality, survival and culture, It is of no surprise that we teach our technological tools, machines and algorithms to operate and 'run' Anthropocentrically. Sutherland was inspired by the Memex from 'As We May Think' by Vannevar Bush. 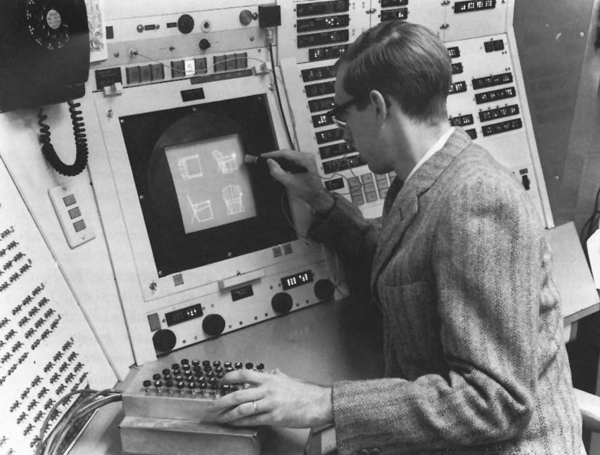 Sketchpad inspired Douglas Engelbart to design and develop oN-Line System at the Augmentation Research Center (ARC) at the Stanford Research Institute (SRI) during the 1960s.